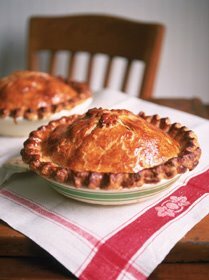 I made an apple pie once with the shape of Vermont on the crust, but don't have a picture of it, so I had to use this one. It was rather fun being a new Vermonter for a while. I was forgiven for planting asparagus roots upside down, and returning a pie plate empty. But as year after year went by, it troubled me that we were still considered novices. We had been humored, watched, and finally accepted on the sole basis of our desire and increasing ability to do our own chores and repairs. But we were not Vermonters.